For many of us, we often times transition from the party-raging young adult to a semi-sophisticated matured individual who enjoys a good night’s sleep. When that sleep is interrupted by a loud party next door, well, we become irritated and want to go out in our robe and pound on the neighbor’s door yelling “turn down that music!”. In the case of Party Hard from the folks at Pinokl, they take it a step (or 30) further and have you dive into a slaughter fest, killing every participant of said party…and then it’s onto the next parties. In the end, no one should be partying except you. This is a controversial game that was originally released on Steam back in 2015. It has since seen a sequel on the PC, but the Nintendo Switch is getting the original plus a little extra DLC. The objective of the parties is generally quite simple as the game tells you, “Kill Everyone”. To accomplish this, you’ll need to stay under the radar of the police who are called in when any suspicious activity is discovered by other partygoers. Presented in very similar aesthetics, theme, and even humor to Hotline Miami, you’ll enter into a level that’s bustling with pixel art characters enjoying a themed party, whether that be on a rooftop, in Vegas, or at a barbecue. Every time you begin or restart a level, there will be some procedurally generated placement & activities to change things up and keep things fresh. Ultimately this just made it impractical to lock down a strategy or plan to accomplish my kill-fest. Completing your single objective is far from easy, as you’ll quickly learn on the first official level. You’ll start with a trusty knife to quickly kill partiers, and around your environment you’ll have access to triggering some events such as poisoning the punch, or causing an electrical fire. This helps aid in maximizing your impact, but if you’re spotted, the cops are called on you. In my time with the game, I found that the cops will be called on you frequently. Did someone spot you slicing that person? Cops are chasing you. Did you press the accelerator on the pick-up truck that mowed over a bunch of civilians, but someone saw you? Cops are after you. You’ll quickly learn that the cops are easily alerted to your wrongdoings, and that they run faster than you. There are some ways to escape however, and some of them boiled down to cheesing the game so that the cops finally dismissed their pursuit. At one point, I would climb out of a window, the cop would try to pursue through the front door, and when he’d get close, I’d climb back in through the window, but the cop would turn around and try to pursue me back through the front door. Rinse and repeat this process three or four times, and they left me be. There are other more intentional methods of dismissing the police, such as changing outfits though if that is your preference. The game is marketed as a stealth game, and after several levels, I found it to be a bit of a split genre game myself. Early in every level, I was definitely stealthy, moving around the party triggering the start of impactful events while slashing unsuspecting characters that were lingering around alone. However, once the parties of 40+ individuals started thinning down, I found myself focused less on stealth, and more in action game mode. Chasing after straggling participants to one-hit kill them, which inevitably someone would see, was a bit of a rush and I’d just run around the party to get away with it. Honestly, it was a good balance of gameplay shifting for me. As you complete your primary objective at each party, you’ll have a loose, slightly comedic, and mature story line that is displayed between events. It’s raunchy as expected for this title, and wasn’t particularly story-deep, although it earns it M rating. There’re unlockable characters that you can earn as well, each having some unique traits that can mix up your strategy of completing a level. You’ll also find an array of achievements that can be completed. If playing through the levels solo gets to be repetitive, playing on the Nintendo Switch also opens up the option to bring in a pal in cooperative play, which is a nice touch that fits with the Switch platform focus. As I mentioned earlier, Party Hard was perceived as a controversial game when it was released before. For many, this will come off as a very tasteless game because ultimately, you’re on a killing rampage of innocents just enjoying their various parties. If we look solely at the gameplay, it’s a hack and slash game with some decent stealth mechanics. It features a visual identity that’ll be very familiar to those that played Hotline Miami, and the randomized generation of each attempt at a level gives the game an ongoing challenge, sometimes for the worse, but yet always still beatable. Party Hard won’t be a purchase for many folks, especially those that find the subject matter upsetting. In fact, having a game with this sort of premise, even with the principle of keeping it lighthearted & comical on the Nintendo platform is a bit surprising, but also a nod at the platform accepting a wide range of genres to be available for all audiences. If you’re in the mood for a mature game with a simple premise but room for strategy mixed with a fair bit of luck, Party Hard will be a game for you. 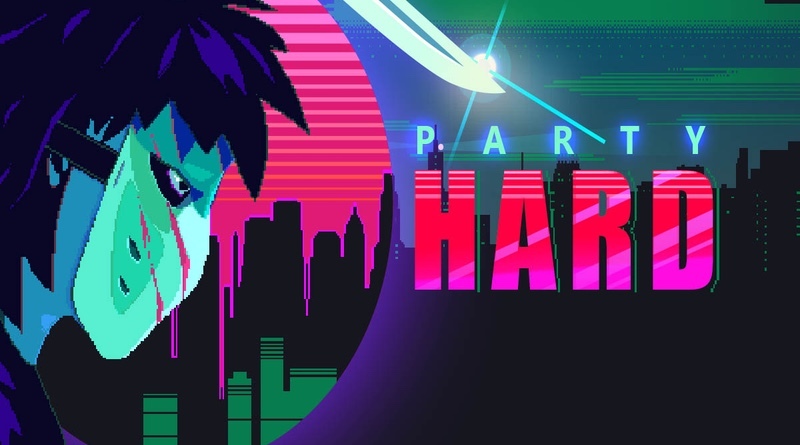 Party Hard is a controversial stealth slasher game that aesthetically shadows much of Hotline Miami. It finds some of its own identity in places, and tries hard not to take itself very seriously. You’ll get the gist of gameplay in the first couple of levels, and then it starts to feel like a monotonous grind. Alex has been actively gaming since the release of the Nintendo. Turning passion into profession, he’s spent just over a decade in game development, and is currently the Creative Director at a studio.